(Nanowerk News) An Australian National University (ANU)-led team has developed the most efficient quantum memory for light in the world, taking us closer to a future of super-fast computers and communication secured by the laws of physics. The team at the ANU Research School of Physics and Engineering used a technique they pioneered to stop and control light from a laser, manipulating electrons in a crystal cooled to a chilly -270 degrees Celcius. The unprecedented efficiency and accuracy of the system allows the delicate quantum nature of the light to be stored, manipulated, and recalled. 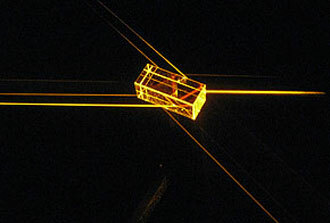 Light passes through the crystal in the quantum memory experiment. "Light entering the crystal is slowed all the way to a stop, where it remains until we let it go again," explains lead researcher Morgan Hedges. "When we do let it go, we get out essentially everything that went in as a three-dimensional hologram, accurate right down to the last photon. "Because of the inherent uncertainty in quantum mechanics, some of the information in this light will be lost the moment it is measured, making it a read-once hologram. Quantum mechanics guarantees this information can only be read once, making it perfect for secure communication." "We could entangle the quantum state of two memories, that is, two crystals," says team leader Dr Matthew Sellars. "According to quantum mechanics, reading out one memory will instantly alter what is stored in the other, no matter how large the distance between them. According to relativity, the way time passes for one memory is affected by how it moves. With a good quantum memory, an experiment to measure how these fundamental effects interact could be as simple as putting one crystal in the back of my car and going for a drive." Dr Sellars' team has previously performed an experiment that 'stopped' light in a crystal for over a second, more than 1,000 times longer than was previously possible. He said that the team is now bringing together systems that combine the high efficiency with storage times of hours. The research team includes Dr Jevon Longdell from the University of Otago and Dr Yongmin Li from Shanxi University. The findings are published in Nature this week.